With Star Trek still going warp speed at the box office, it's hard to grasp a time not long ago when the entire Star Trek brand had been written off by many people as a thing that had completely run its course. The previous few movies in the series had been severely lackluster and Star Trek: Enterprise failed to garner appreciable ratings on television. Such was the state of Trek five years ago in 2004. And at the time J. Michael Straczynski (the creator of Babylon 5 and writer of the recent film The Changeling on top of many other terrific endeavors) and television producer/writer Bryce Zabel (The Crow: Stairway to Heaven, Dark Skies), recognizing the franchise's foundering, conceived of an ambitious plan to "reboot" the entire shebang. A few years later Paramount handed Trek over to J.J. Abrams and Bad Robot. We already know how much of a stellar success that has been... but what about Straczynski and Zabel's treatment? 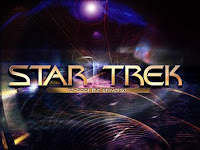 Bryce Zabel posted the entire "Star Trek: Re-Boot the Universe" treatment on his blog a little less than three years ago. It's quite an interesting read, especially how he and Straczynski re-defined the "Prime Directive" into something much more proactive and driving as a plot element, along with the entire rationale for needing to relaunch the series to begin with. I remember reading this a few years ago and it sounding like a good idea, especially with JMS being involved. J. J. Abrams has now proven that a reboot of Star Trek is possible in movie form. Now, I'd love to see Star Trek continue as a series. Obviously, a series about the Enterprise would be preferable, but I'd even settle for a show based on another starship within the rebooted universe with another crew as long as it adopted more modern TV storytelling conventions of a continuing story arc, underlying mysteries, and characters that grow, learn, and sometimes sadly, die. In fact, what Abrams has already done with the movie could still neatly fit within the ideas set down by JMS & Zabel with only a few small adjustments. Some have said that the Star Trek franchise is dead. I think it's more accurate to say that the old way of doing Star Trek should die, but Star Trek can live again if it's just given a new approach. A new movie is nice, but Star Trek is a TV-based franchise. To me, it's not fully alive until it's back on TV, and I believe it can be done correctly, all over again.